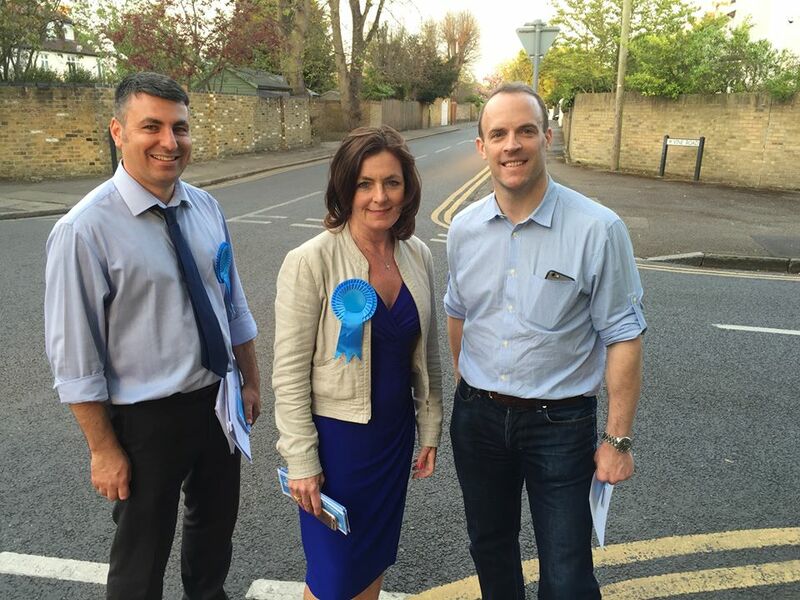 Steve Bax and Debi Oliver with MP Dominic Raab on polling day. Politics is a funny old business. Sometimes you're up, other times you're down. For the Molesey Conservatives the 2016 Borough Council elections were definitely a low point, though we are determined to rebuild and return stronger. For anyone who hasn't seen the results, they are posted here. In summary though, our political opponents the Molesey Residents Association won all six of the Molesey seats in the new 48-member Elmbridge Borough Council. Myself (Steve Bax) and my hard working and effective colleague Peter Szanto lost our bids for re-election, and our ability to deliver on the important causes we have championed for our residents - from parking controls to Heathrow noise - will now be much more difficult. This year's elections were the first to be fought along the new wards drawn up by the Boundary Commission. They agreed to a Conservative proposal to reduce number of councillors from 60 to 48, a more appropriate number for today's council, and redrew all the wards. In Molesey the old North, East and South wards were replaced by Molesey East and West, but around 1,500 former Molesey East voters were moved into Thames Ditton - the Molesey Conservatives wrote to the Commission opposing this illogical and unsatisfactory move and warned voters would be disenfranchised. They went ahead anyway. In Molesey West our three local candidates, Richard Doxford, Philippe Bassett and Inna Spektor, fought on a strong Molesey manifesto with proposals for saving the Hospital, improving Molesey Heath and to press for a local secondary school. They put up a good fight but clearly the MRA is still very entrenched in West Molesey and the Conservatives have a lot of work to do to win hearts and minds. West Molesey champions Inna Spektor and Philippe Bassett. Most disappointing was the result in Molesey East where the MRA topped the poll with 1,576 votes, 1,517 and 1,437. Steve Bax finished fourth with 1,159, Peter in fifth with 925 votes and Debi sixth with 888. The unusual situation this year where everyone had 3 votes appears to have benefitted Labour and the Greens who picked up votes, though UKIP was in last place and suffered a poor result which was mirrored across Elmbridge. After the shock of the result - we expected a close fight with the MRA but not to be hundreds of votes adrift - I spoke to the Surrey Advertiser after the result. I said: "I'm really proud that I was able to represent the people of Molesey East for the last two years. It was an amazing privilege and a really fulfilling part of my life. I hope I can be back one day but at the moment I don't really know where we go from here." It is difficult to pinpoint exactly what went wrong in East ward this year, but to my mind there were three main factors: first that national factors played a part, government unpopularity and the rows over Brexit badly affected the Conservatives across Elmbridge; second the boundary changes which stacked the deck heavily in the MRA favour by moving 3,600 voters from the former West Molesey wards where they dominated, into East ward which the Conservatives won in the last two years; and third a nasty, negative eve of poll letter from the MRA highlighting that Peter, Debi and I live outside of the ward that will have damaged us with East's new voters. It is a huge disappointment and deeply frustrating to see all of the gains from the last two years wiped out in one stroke, especially as Peter and I had been making such good progress. We now know the political lay of the land and the nature of the challenge. Our task is to consolidate our existing supporters and win supporters in the new roads that have joined the ward. We believe this work is in Molesey's interests as we are providing a democratic alternative to MRA unhealthy one-party rule in Molesey.